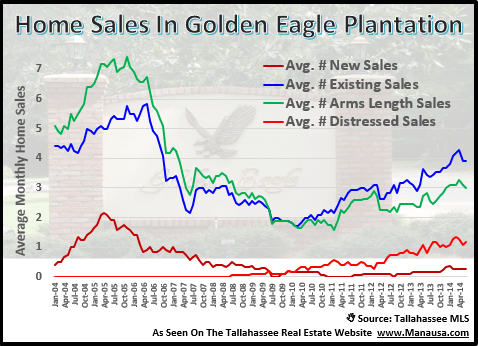 Home sales are clipping along again in Golden Eagle in NE Tallahassee. This popular neighborhood was grossly over-supplied with homes over $500,000, but a strong 2013 chipped away a portion of the excess of houses on the market in this Tallahassee golf course community. 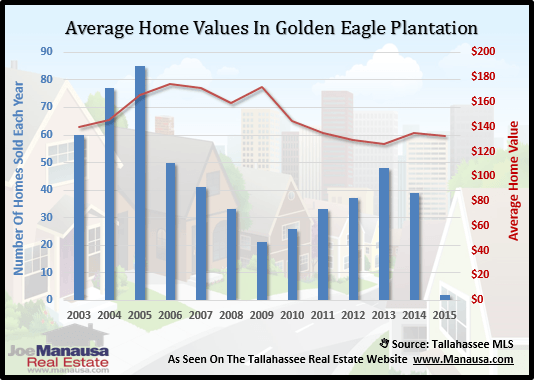 Through mid June, 2014, there has been 20 closed home sales in Golden Eagle Plantation in the Tallahassee MLS and the inventory still strongly favors homebuyers. 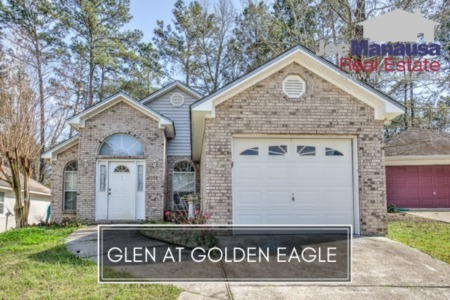 Currently, there are 32 homes for sale in Golden Eagle Plantation, and 4 are selling each month after starting the year off with no sales in January. Measuring at a buyer-favored 9+ months of supply, Golden Eagle's rate of sales has been rising as buyers take advantage of "below cost" prices and historically low mortgage interest rates. The graph above shows that new home construction is still fewer than one home per month, while distressed home sales remain high at 1 per month. 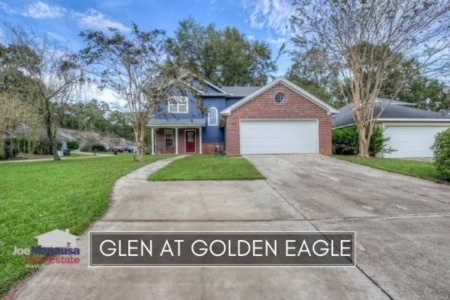 Home sellers must understand that more than 1 in 4 homes sold in Golden Eagle Plantation are short sales or foreclosures, meaning buyers are very skittish on paying top dollar for a home. 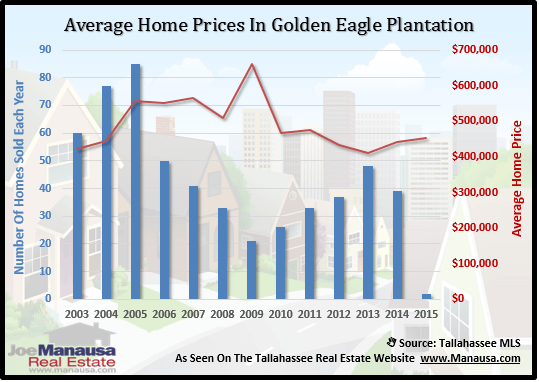 The average sales price of homes sold in Golden Eagle Plantation is on the rise. I believe this is the result of cheap money. Low interest rates compounded with the reality of soon-to-be rising interest rates have buyers grabbing the bigger homes right now. Home Values Turning The Corner? Real home values appear to be finally moving off of a bottom established three years ago. The plethora of short sales and foreclosures had only the most prudent shoppers excited in recent years, but the threat of cheap money disappearing for buyers is bringing forward people recognizing the opportunity for moving up. The people that buyer in Golden Eagle Plantation this year (and the last two years) will be looking pretty smart when rates shoot back towards the fifty year average. I hope you enjoyed this Golden Eagle Plantation Home Sales Report, please give us a call at (850) 366-8917 or drop us a note and let us know how we can help you with your housing needs.